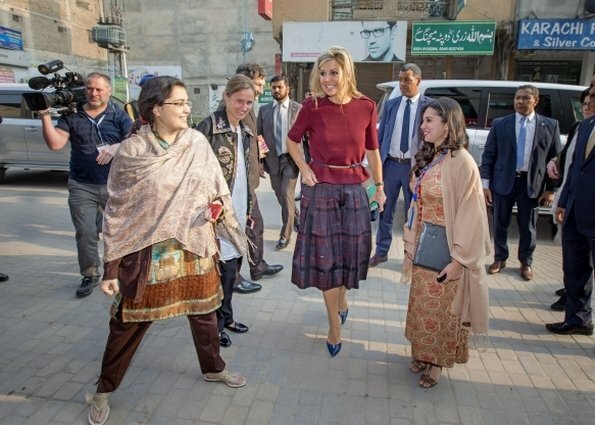 On February 10, 2016, Queen Maxima of the Netherlands visited Benazir Income Support Programme (BISP) in Rawalpindi, Islamabad, Pakistan. Queen Maxima is in Pakistan as United Nations Secretary-General’s Special Advocate for Inclusive Finance for Development to promote and support financial services in development countries. All these excessive facial expressions she makes is not becoming. I agree with AnonymousFebruary 10, 2016 at 1:32 PM, smiling is of course always recommended but the 6th photo is just to much, not chique i think. Don't forget she is from Argentina!!! Maybe theatrical, extravagant, a little gaudy- but no this is not all Argentines. Argentina is a country of South America and the people here are very warm and joyful!! Excuse me Miss and Mrs perfect. This have nothing to do with nationality or blood, just having fun! That is the right length for the skirt to make woman look elegant and still young. HM QM is a brave, intelligent, caring, beautiful, highly educated person. The correct attire for Pakistan. I just don't get how the likes of Mary who showed her ballerina moves in a Moroccan Musk could exist in the same world with HM QM.... Very puzzling indeed. You just Don't get anything, sorry. Maxima is a big girl. She doesn't need Mary in order for people to read something about her. But unfortunately for HM she has to socialize with Mary. Weddings.... What do they have in common at all. HM is a highly educated woman who had a brilliant career before marriage. Highly articulate in Dutch. Great personality.... and then there is Mary... this is what I don't get. Please stop about this highly educated, because Maxima is not, she only has a bachelor like millions of other people. If you think there is more, come with proof, and with proof i do not mean Wikipedia! O, and something else: her Dutch is not good, it is so so. Her Dutch is certainly only average she makes many mistakes it has really not improved any since her early years. @Iris I do agree with you. Bachelor degree it does not mean highly educated. Probably she is very intelligent but that we don't know also. We know her public life but we do not know her private interests. And for your information Mary has a double degree. She is no pauper in that field. What does it mean "double degree" anonymous 1:58 ? It can be Bachelor degree or Master degree or Doctorate. Anonymous 8:15. What a nasty comment. Maxima herself would hate your comments about her friend Mary. I am completely happy she can still make facial expressions that is is not using botox etc. stuff. She really lights the room she is. I can't understand why some people on here have commented so negatively on images captured of QM, smiling and being at ease with people ! Far better a smiling warm monarch, greeting a group of people, than a poe faced monarch ! She's an absolute delight to see and read about, so let's try and be a bit kinder in our comments about her ! It always amazes me that when someone visits a country like Pakistan, they dress very conservatively to try and please their hosts. Yet when those same people visit The Netherlands or any other liberal Western country, they do not try and blend in to the way we dress. It's always one-sided. Understand what I'm getting at? Definitely! I agree with you completely. Yes, I think that I understand what you want to say. But I think that when women from Pakistan wear Western clothes they do something wrong because of their religion or their culture. That's different for Western women. It's okay for them to dress conservatively. I think Maxima is great. I love that Maxima is vibrant and gregarious! That she smiles, laughs and engages with people. I think it is part of her charm, whether or not it is “Latin” I cannot say, I just think it is lovely. I think Maxima is beautiful too! I love the shawl she is wearing, the colours are gorgeous, most of the time I enjoy Maxima’s style. I also don't understand the need to compare one person to the other. Maxima is Maxima and Mary is Mary. They both have individual styles which work (most of the time) for each of them. I think it is lovely that they both seem to get along so well together. It looks as though a genuine friendship has formed, which I think is wonderful. I think it is lovely too, that both Princes were able to marry women the women that they loved, that times have changed and Royal Families now accept people into their ranks who are not of Noble birth. Both Maxima and Mary have stepped into roles that they were not born into, they have stepped into a life they were not accustomed to, in countries that they were not accustomed to, and they did so because of love. Both women left their homelands and their families and moved to the northern hemisphere, where they had to learn a new language a new customs. Perhaps rather than tear them down for their less than perfect language skills, they should be applauded for their duty and their diligence in their ability to adapt to their new life in their new homelands, and perhaps they should also be applauded for taking on such daunting roles for LIFE. It isn’t all about, Palaces, nice clothes and wearing beautiful shoes and jewellery. Maxima and Mary have committed to spending the rest of their lives in service to their adopted homelands, to meeting countless people, shaking numerous hands, attending countless meetings and charity events (most of which are probably boring). Life in a fish bowl can't be easy for anyone. Not Letizia, Mathilde or Mette-Marit, but at least these women were raised in their respective countries; they know the languages and the customs. Not all Argentinians are fun loving, warm and joyful, most especially in her case given the fact of her upbringing with a father that was not permitted to attend her wedding. . However she married a royal and became a queen, and now yes she has many reasons to laugh and be joyful, wouldn't you? I personally think she goes over the top a lot of time, her behavior, clothes, jewelry, hair etc. A bit too much. She is quite vibrant and exuberant. Has always been that way from the first day people got to know her. She is true to herself, and I'd rather see someone who's got such warm and charisma than a pretty but dull and boring one like Kate or Marie.